Given the Russian military’s development and deployment of a prohibited ground-launched cruise missile in violation of the INF Treaty, the Trump administration intends to withdraw from that agreement in six months. The world without the INF Treaty will be less stable and less secure—for Europe, the United States and Russia. With the treaty’s demise, Russia will be free to openly deploy intermediate-range missiles. NATO will consider military countermeasures. The Pentagon is developing its own intermediate-range missile (development is permitted by the INF Treaty as long as it does not involve flight testing). With the treaty’s end, it will be free to test and deploy the missile. There is no reason to expect a new agreement in the near term, especially since neither Moscow nor Washington seemed particularly interested in preserving the existing treaty. 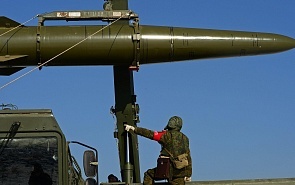 Russian officials, moreover, assert that the next nuclear arms control agreement should be multilateral and have expressed concern that third countries have intermediate-range missiles. However, those officials have never advanced a definitive proposal for multilateral talks or answered the question: how could a multilateral agreement have equal limits when Russia and the United States each have more than 13 times as many nuclear weapons as any third country? Of perhaps they think that China and other third countries would agree to unequal limits? A more urgent question facing the two countries is maintaining the 2010 New START Treaty. New START constrains Russian and U.S. strategic nuclear forces. In contrast to the INF Treaty, Russia has complied with New START’s limits. But New START expires in two years. It can be extended by up to five years with agreement of the sides, and that would be the sensible thing to do. Extension, however, is by no means a given. Russian officials ought to consider this and whether they desire to maintain constraints on U.S. nuclear forces. Over the past 50 years, Moscow at times has taken a cavalier attitude toward compliance with its arms control commitments. It did so knowing that U.S. administrations usually attached high importance to arms control and would strive to preserve treaties. That is no longer the case. President Trump has little understanding of the complexities of nuclear arms, believes New START is a bad deal, and disdains virtually anything done by his predecessor (New START was signed by Presidents Obama and Medvedev). National Security Advisor Bolton dislikes arms control agreements in general. Neither Secretary of State Pompeo nor Acting Secretary of Defense Shanahan has shown much interest in nuclear arms control. It is not clear that Washington will seek or agree to extension of New START. If New START lapses in 2021, the world will become even less stable and less secure. Nothing would then limit the number of strategic missiles and bombers that Russia and the United States could build, except perhaps their budgets. Without the information that each side receives from New START’s data exchanges, notifications, inspections and other verification measures, both militaries will fall back on worst-case assumptions about the other. That invariably will lead to more expensive decisions about how they equip and operate their own strategic nuclear forces.